Doing any Baking this Weekend? Hello and Happy Friday! 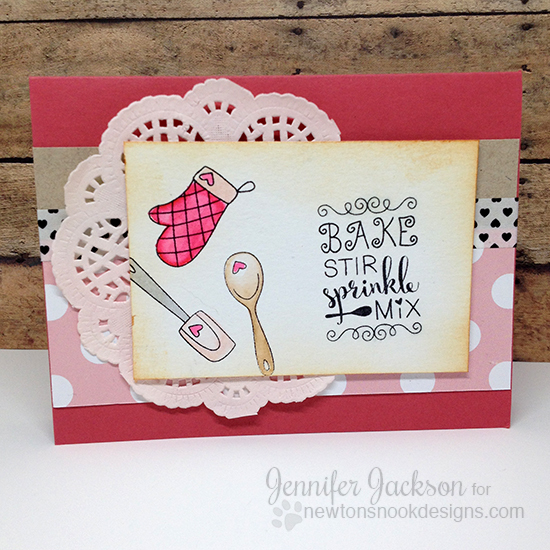 Today I'm sharing a fun card that I made with using our Made from Scratch stamp set. 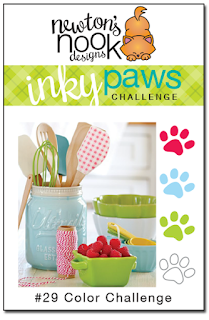 I am really enjoying this new stamp set - it makes me want to go in the kitchen and bake some cookies! I hardly ever do any baking but this adorable set definitely puts me in the mood!! LOL! 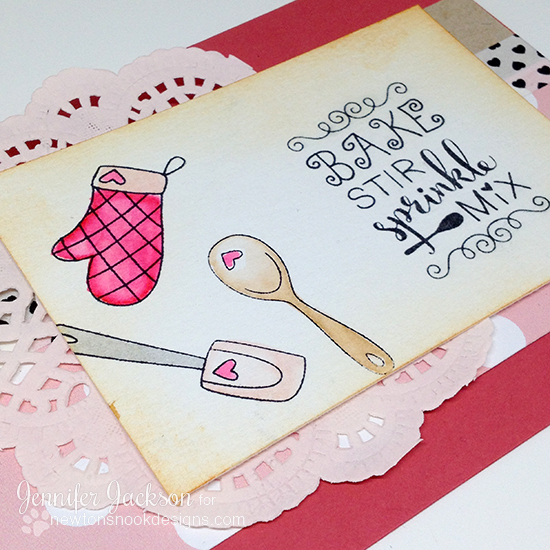 To create this card, I stamped the oven mitt, spatula and wooden spoon on one side of a piece of watercolor paper and the sentiment "Bake, Stir, Sprinkle, Mix" on the other side with waterproof ink. Then I colored them with shades of pink, grey, and brown using zig clean color markers. Then I added some distress ink to the edges. To finish the card I layered it with some pink polka dot patterned paper, some heart washi tape and a pink doily! I love how this turned out. It's also nice to have cards like this in your stash that are not specific to an occasion. They're prefect for sending out to just say hello but you could also use it for a birthday or thank you card, just add a sentiment on the inside! Hope you enjoyed this card today! If you want to add this set to your collection, you can find the Made from Scratch stamp set and coordinating Made from Scratch Die Set for sale at newtonookdesigns online shop. Very cute! Love the doily with this set! How sweet are you little baking images, sporting wee hearts! 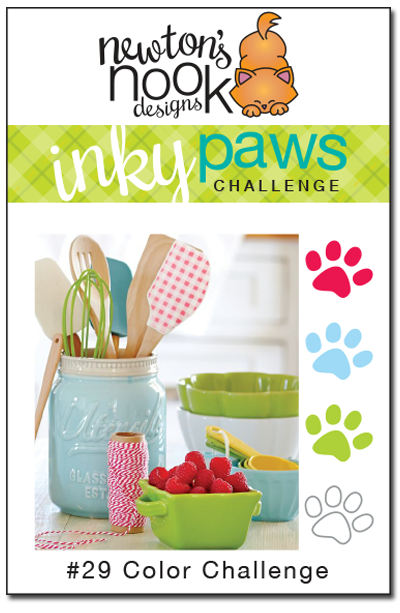 I have a sudden desire to whip up a batch of cookies!